Note: We paid for the sticker and service ourselves and did not receive any compensation for this or our other reviews. We recently took a 15 day trip that took us across Europe during Christmas and New Years. This allowed us to see wonderful Christmas markets and winter wonderlands … and also gave me a chance to test out KnowRoaming. 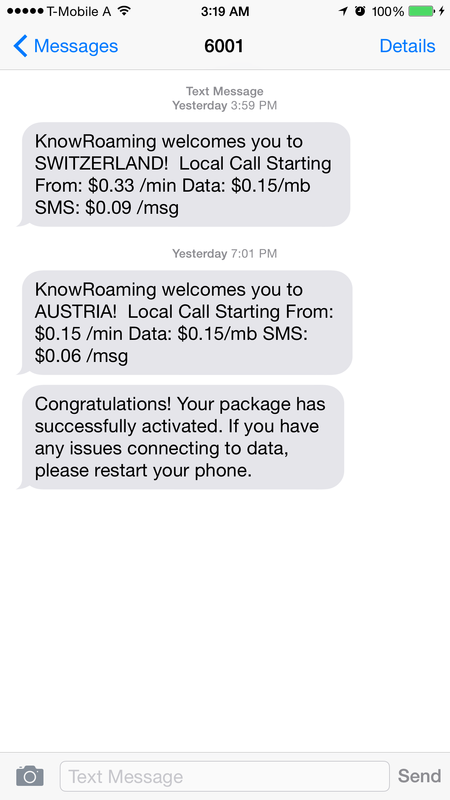 KnowRoaming (“KR”) is an innovative solution to international roaming. Instead of paying your mobile carrier outrageous fees (AT&T/Verizon both charge around $30 for 120MB, $60 for 300MB and $120 for 800MB of data), you install a sticker on your SIM card. Once you go outside of your home network (e.g. 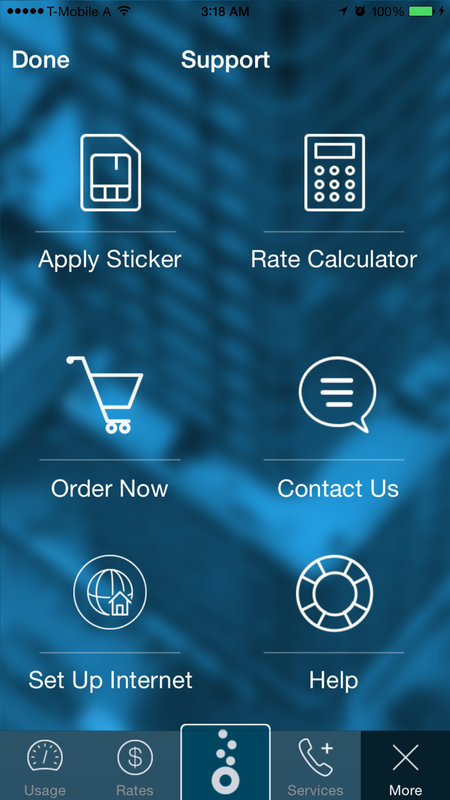 outside of the US) the KR sticker detects that and switches you over to its own network and providers on which it has negotiated rates for calls, texts and data. 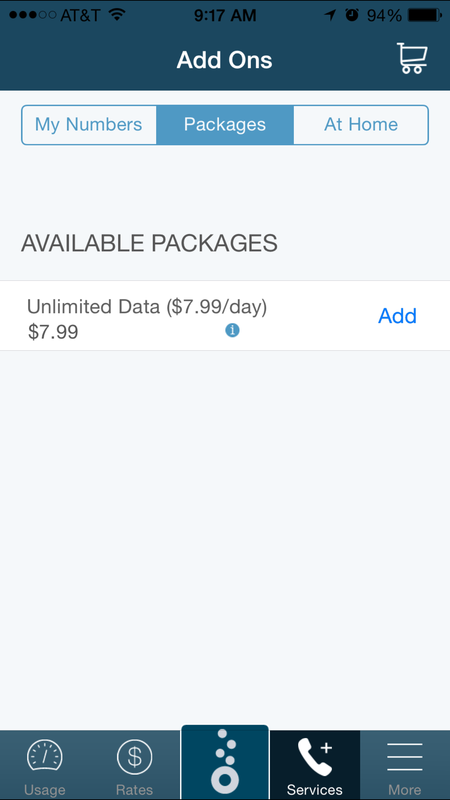 You can either pay per use or buy daily unlimited data plans for $7.99 per 24 hours. KR has been covered by the press – Forbes, Engadget and more. However, there were very few actual user reviews so hopefully our DINKTravel review will be helpful to you world travellers out there. KR has excellent guides and videos for how to install the sticker and setup your account so we will not be rehashing those here. Data Package: KR has a data package for $7.99 USD which provides unlimited 3G data for 24 hours. You need to buy the package one day at a time, which is a bit clunky and could raise flags with your credit card company. I wish KR provided options to buy 24/48/96/longer packages at a time. This would be easier to provision and save some of the hassle with ensuring that you remember to activate the packages each day. Also easier for those of you expensing data to your employers. Activation: Upon successful activation you will get a text message letting you know that you are good to go and if you have data problems to restart your phone (we had to do this a few times to get it working in some countries). 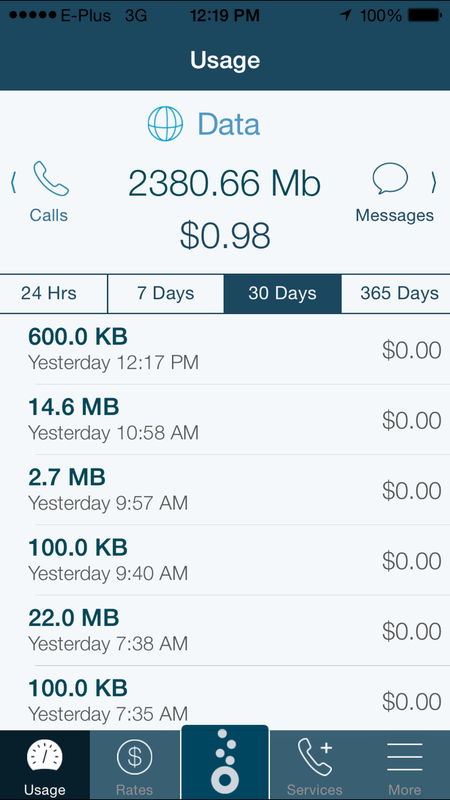 The app will also show you a countdown timer for how much longer you have until your data package expires. The app has a few bugs and needed to be restarted to get the correct time left a few times. Nothing big, but room for improvement. We personally used it in Austria, Czech Republic, Germany, Poland, Hungary, and Switzerland. The roaming signal was strong and compared to our AT&T roaming often used the same networks at the same speeds at a fraction of the cost for unlimited data. So that is a huge positive. Speed: The speed test above was pretty normal for the service. Sometimes it would get faster and sometimes slower, but always a decent speed for 3G. Speeds will vary depending on the local carriers and in Europe and Eastern Europe it was pretty good. Outside of major cities you might fall back to EDGE, but that is a local network limitation as our AT&T phone did the same when we were travelling by train. 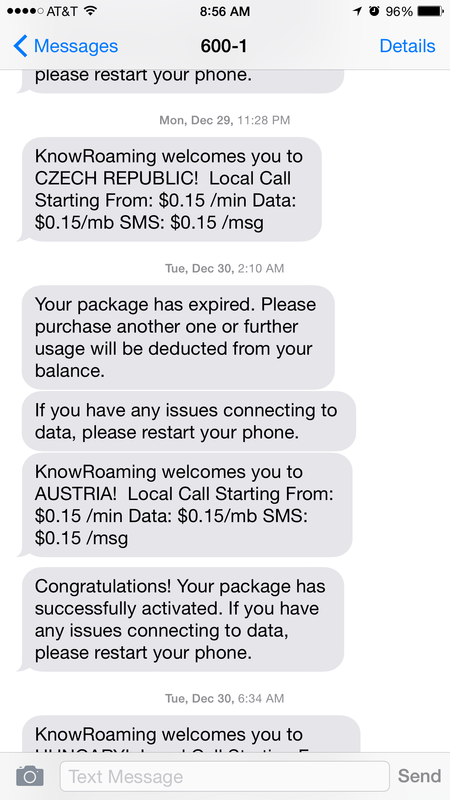 Happy New Years: We spent New Year’s Eye and Day in Budapest, Hungary and received this message from KR letting us know they were giving out free data for all of New Year’s Day. It actually started a bit before midnight, which was nice and if you had already bought and activated a 24 hour data package KR extended your time by 24 hours. This was unexpected and a great bonus while travelling. We didn’t enter the contest but were able to upgrade some great shots to FB and Flickr due to this promotion. Summary: Over the 15 days were were travelling we used 2380.66 MBs of data on KR. This would have cost around $360 if you had AT&T and paid $120 per 800 MBs. 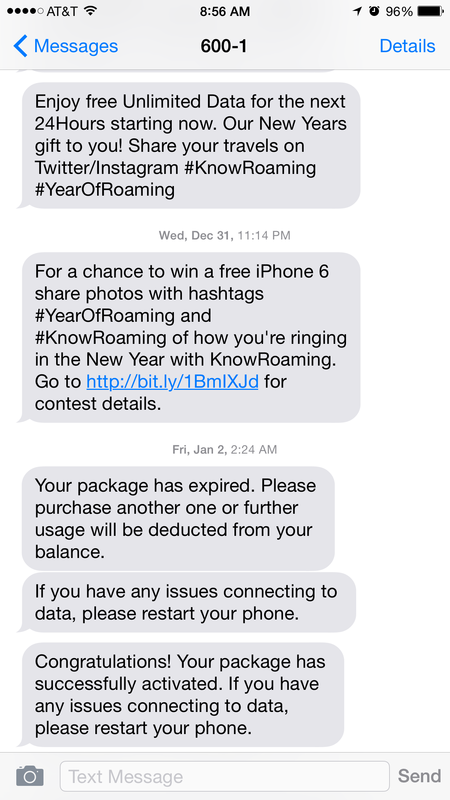 Our total bill for data was $111.86 on KnowRoaming for 15 days of data (24 hours provided free during New Year’s Day) so that is a huge savings. It is also just very nice to know you have unlimited data and now have to worry about using less. We were able to watch YouTube videos, post to Facebook and do lots of social media without worrying. We even did some work while travelling and when hotel Wi-Fi was too slow or unreliable we could count on KR as a backup. Overall our experience was a 9 out of a 10. 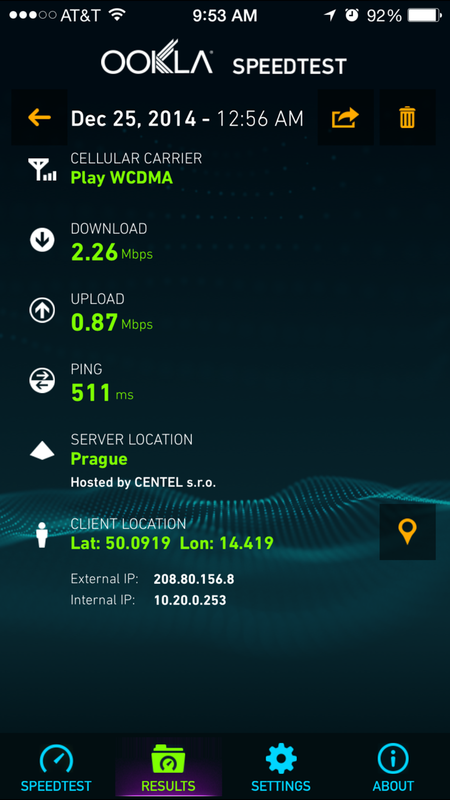 Not perfect, but close and the best we have found for multiple country data roaming so far. Local SIM cards can be cheaper, but in our experience its a hassle to get them if you are only in a country for a few days. We used to wasted a few hours each country tracking that down … no more. Support: We did have one data connection issue (see image below) while travelling that required us to write into support. They were very quick and reset the connection on their side and things were up and running again. Also upon landing back in the US our AT&T network connection was on LTE but we had no data connection. We tried using the KR app to guide us to get data back (as you are suppose to), but that just took us through installing a roaming profile again. 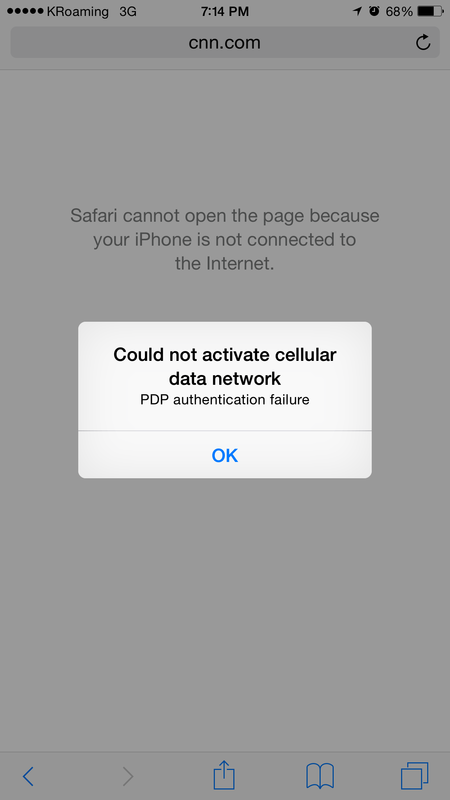 Ultimately we found the problem was in the config file on the iPhone which was stuck on KR. Once that was deleted US data worked again. If we were not technical folks we would have been lost and while KR support is very responsive this would be a major hassle. We would recommend you get familiar with your phone settings before you leave just in case you need to fix this.